Find hotel near Ramayana Cave - Suyambu L .. This is a Hindu-designed cave with small fountains that acts as a place of worship. The main attraction of this place is the self-manifested Suyambu Lingam. It was found about 3 years ago high up on the Batu Cave. You can climb the stairs carved from the cave stones to reach there. The whole area is well-lit and clean but has an eerie silence. The Aanjenayar Temple devoted to the Hanuman is beside the Lingam. You can see the gigantic and colorful statue of Hanuman at the entrance. Along the way through the caves, you will be enchanted to see the golden horses and the huge colorful statues depicting the story of the Hindu Holy Book Ramayana. Bid waterfalls provide soothe to this place and you can meditate here. You will feel blessed visiting here. Try the best Batu Caves trip planner to visit this Ramayana Cave - Suyambu Lingam as well as many others. You won't miss your home when in Batu Caves, hotels in Batu Caves like Crossroads Hotel, One Damansara Guesthouse and Empire Damansara offer some of the best places to stay in the city. Generate executable plans on your own or book the top rated Batu Caves vacation packages for your visit. Read more on how to reach Batu Caves. Amazing temple just as beautiful as Batu caves (maybe more actually). The cave was so nicely decorated and full of interesting stories that it was definitely worth the rm5 that I had to pay to get in. Inside, it is quiet and full of magic and mystery. Go there without an hesitation! Especially if you want to get away from the crowds! A worthwhile visit which shouldn't be missed if you're already at Batu Caves. There is a lot to see at this cave. The entrance is filled with interesting statues, monkeys, and even swimming monkeys keeping cool. Inside there are many more statues telling used to tell stories throughout your walk deep into the cave. There is a small fee to pay to enter this site. There are lots more steps in side, which there isn't really anything at the top worth seeing - so you may choose not to walk to the very top. Don't miss the giant statue of Hanuman nearby - it really is impressive. A pageant in a cave. There is a lot going on both at the entrance and inside the caves. Life size and larger than life selections of scenes from Hindu stories. 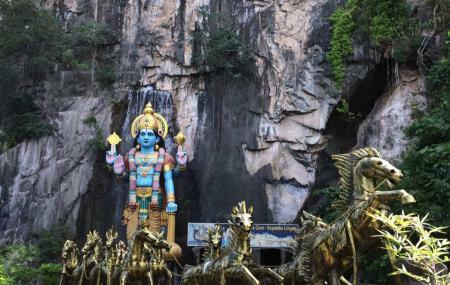 Likely to be less crowded than the main Batu Caves and well worth a look. It’s just next to the train station. Cooler than Batu Caves! There was a cheap admission fee, but so worth it! Most people leave after Batu, so this place is usually empty. Very cool place to be alone. I had the whole plave to myself. Hundreds of life size statues depicting stories feom the Ramayana epic. Really unique and worth checking out.